This post has 5,947 views. We drove our way to Atlantic City, and it was a fairly lengthy drive compounded by the traffic in the New Jersey area. All of the freeways there have lots of cars even on the weekends, and traffic got pretty slow in some areas. Other than traffic, the way to Atlantic City isn’t particularly difficult or memorable. Once we got close though, we could see all of the tall casino-hotels dotting the skyline. 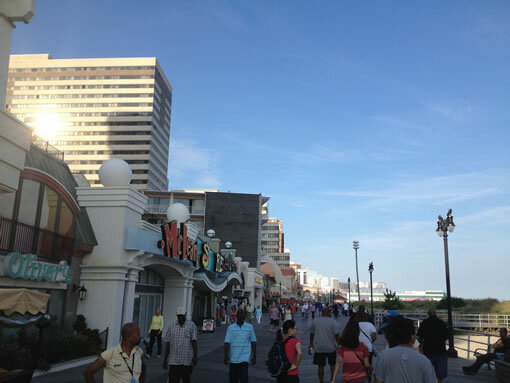 The Atlantic City Boardwalk is the longest and one of the most famous boardwalks in the world. Before going on the trip, I have heard from people that Atlantic City was a little run down, but when we got to the famous Boardwalk I thought the area looked pretty decent. The Boardwalk was fairly clean and looked like it’s been maintained fairly well. The whole waterfront area had lots of people, various shops and restaurants along with the big casinos, and a good atmosphere overall. There was lots to do, but we didn’t have that much time so we mainly just walked around and checked out a few shops. We also visited the factory outlets in the city. I had a coupon for Van Heusen and so I ended up paying 40 cents for a patterned shirt that I’ll probably use as a Hawaiian shirt in the future. The beach at Atlantic City. We did spend some time playing around on the beach. The beach at Atlantic City was decent. There were lots of little shells and pieces of stuff in the sand, but they didn’t really bother me. 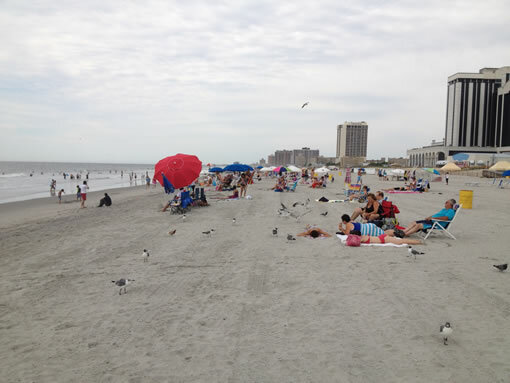 The best thing about Atlantic City’s beach was that it’s free to access, which is in contrast to many of beaches on the Jersey Shore that charge entry fees. Another plus was that While there were lots of people on the Boardwalk, the beach was not that crowded. With going to the beach as one of my goals for the trip, I brought along my beachwear to go in the water. The waters around Atlantic City is actually not too cold and I could definitely swim in there. This is actually the first time I’ve been in the waters of the Atlantic Ocean. I think I’ve been in the Indian Ocean, and I’ve probably put my feet into the waters of the Pacific, but this was the first time I’ve been in the Atlantic. I heard good things about the casino buffets, so for one dinner I went to the buffet at Caesar’s. It turned out to be a long wait, and the buffet was nearly $40. The selection wasn’t that great, but the thing it had going for it was all you can eat snow crab legs. I tried to devour as many crab legs as I could in order to make the buffet worth it, but alas I’m not really a big eater and could only stuff down three clusters of crab legs before calling it quits. If I do return to Atlantic City I’ll look for a buffet with better pricing. Of course, no trip to Atlantic City is complete without some gambling. I had wanted to try some Blackjack, but all of the low bet tables filled up and the higher tables were a little too expensive for me. I ended up playing slots. There was one point when I was up $10, but at the end of the night I lost about $8. I’m not much of gambler anyways. My friends played some sort of poker and ended up with a $40 profit at the end of the night. 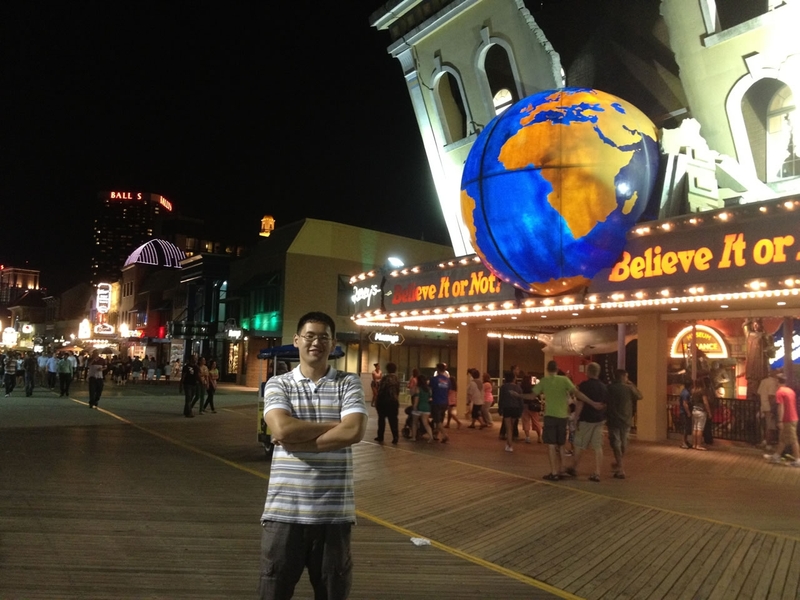 Overall, our trip to Atlantic City was pretty fun, although I wish we could have stayed longer. Hotels during the summer season weekends were quite expensive so we only stayed one night, and that didn’t leave us much time. Next time maybe we could stay two nights or more so we could get a chance to watch a show, try the different restaurants and bars and try my hands at the table games. I got a membership card at a casino and supposedly they should send me coupons for free buffet and hotel. If I ever get those maybe I’ll go back to Atlantic City again.